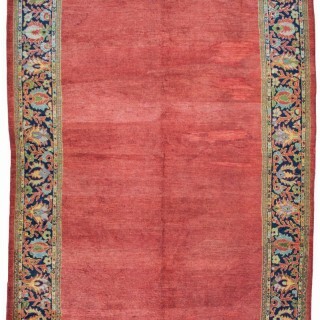 An unusual plain red field antique Ziegler carpet in excellent condition. The pile is high all over this antique carpet woven in Sultanabad around 1880-1890. The border design or floral motifs and scrolling vines has fantastic pale blues and muted greens adding great character and complimenting the rich red main field. The main red background has great variety in the dyes which is why we see clear changes in colour which is known as ‘Abrash’. A few old repairs in this carpet, but they have been done to a very high standard. Please see all the additional photographs. A lot of antique Ziegler’s will have a central medallion so this piece is very easy to place in a room with a fireplace as it does not have to be centralised and can allow furniture to sit anywhere on it happily. Would work beautifully on a wooden floor in a study or living room. Antique Ziegler carpets are famous due to a smart Swiss businessman who In 1883 used his company Ziegler and Co, of Manchester, England to establish a Persian carpet manufacture in Sultanabad Persia. Which employed designers from major western department stores such as A B. Altman & Co of New York and Liberty, to modify 16th- and 17th-century Eastern designs for the more restrained western taste. Using highly developed dying techniques, and the best artisans from the region, the Ziegler Co created rugs with bold, decorative all-over patterns and with softer palettes than their vibrant Persian counterparts. 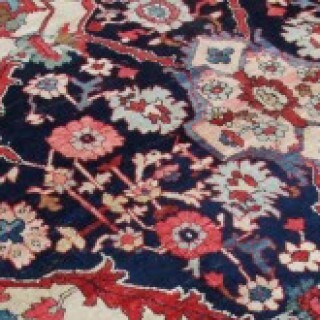 Taking the small intricate patterns of finer persian carpets and enlarging the floral motifs to use on these Zieglers. If you would like us to visit your home to show you this carpet in situ, please request a home visit below to select a convenient day and time or email us to view it at our barn showroom.